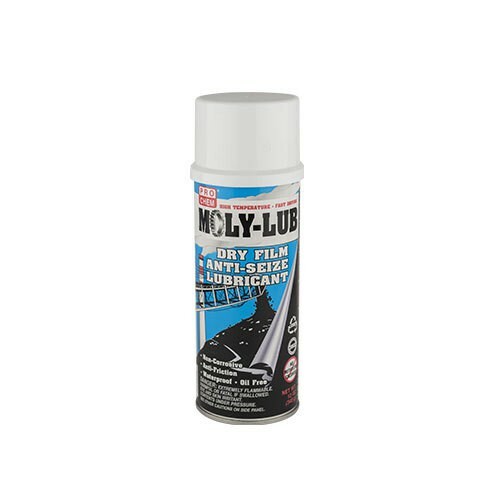 MOLY-LUB | Pro Chem, Inc.
MOLY-LUB is an extreme range lubricant and antiseize coating that withstands temperatures from -110°F to +1050°F, resists pressures up to 100,000 psi and is resistant to water, oil, alkalis and many acids. It contains pure molybdenum disulfide particles, which burnish themselves into metal surfaces and provide a bonded lubricating film. This product will not attract dust and provides a tenaciously adherent coating, even under salt spray conditions. It adheres to metals, rubber, glass and most plastics. Shake can vigorously before application. Surface must be free from loose rust, oil, grease and old paint. Hold can 8-10 inches from surface and spray in a sweeping motion to ensure a thin, uniform coating. Allow first application to dry 3 to 5 minutes before applying second coat. Important: To prevent clogging, after each use invert can and spray a few short bursts to clear valve. Caution: Do not use near heat, sparks or open flame.